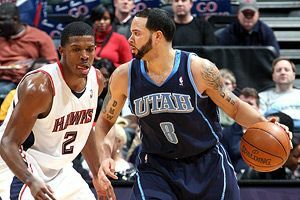 » Can Joe Johnson and Deron Williams Coexist in Brooklyn? Can Joe Johnson and Deron Williams Coexist in Brooklyn? The initial collective reaction to the Joe Johnson–to-the-Nets trade was laughter. The Nets are taking on one of the worst contracts in basketball while seemingly limiting their chances of landing Dwight Howard. Let’s look at how Johnson can fit with the Nets on the court. Joe Johnson, or ISO-Joe, as he has been affectionately called by bloggers for a little while now, needs the ball in his hand and holds on to it, almost always to the detriment of the team. But there is still hope for a core of Deron Williams (assuming he stays, of course), Joe Johnson, and Brook Lopez, if Johnson is willing to play off of the basketball a little more. He never did that with any consistency while he was with the Hawks, though it’s not clear if that was by design or not. Thirty-five percent of his total possessions were isolations (Synergy Sports labeled 22.7 percent of his possessions isolation plays and 12.2 percent as post-up plays). But just because Johnson didn’t play off the ball often (only 16.7 percent of his possessions were spot-up plays) doesn’t mean he can’t. Last year, he scored 224 points on 188 spot-up possessions, which translates to a PPP of 1.191 and the 94th percentile. Johnson is a big guy with a high release point on his quick shooting motion. He has range and the ability to find the open area when his man turns his back on him. As you can see from the video above, Johnson is a good shooter both when working off of a teammate’s post-ups or when he is the spot-up man outside of pick-and-rolls. He deftly reads his man to create space, get open, and provide a passing option to his teammate. Once he makes the catch, he can knock down a jump shot or pump fake and drive by his man and get to the rim. Getting open is key for him: He shot 50.4 percent in “unguarded” catch-and-shoots (according to Synergy). The problem for Johnson is that he didn’t get open a lot. With Atlanta, only 53.8 percent of his catch-and-shoot jump shots were considered open by Synergy Sports, a percentage that was good enough to be 253rd in the league (out of 370 qualified players). With the Nets, he will be joining two solid passers in Williams and Lopez, and they should be able to create more open catch-and-shoots. Williams is one of the league’s best point guards. He can break down his man, force the help to come, and make the correct kick-out pass. With Williams attacking out of pick-and-rolls and out of isolation situations, and with Joe Johnson spotting up, the Nets could be tough to defend. Does the defense stay on Johnson and allow Williams to attack the rim? Or should they help off of Johnson and allow Williams to hit him with an open pass? Brook Lopez is also a very good passer out of the post. People seem to forget about him — maybe it’s because he missed 61 games this year due to injury or because nobody can stop talking about Dwight Howard — but he is a very good player in his own right. He’s an effective scorer out of the post, overcoming the constant double teams. He hasn’t previously played with someone to alleviate the post pressure, but Joe Johnson can be that guy. Two seasons ago, Lopez posted a PPP of 0.960, good enough to place him in the top 23 percent of all NBA players. He often draws a double team, but fortunately he is a willing passer. With the new acquisition on the other end of that post entry pass, everything is easier for the Nets. If the defense continues to double Lopez, he has an easy pass to an open Johnson. If the defense stays home, Lopez now has room to work with in the post. In addition to Johnson’s work off of the basketball, because he is comfortable with the ball in his hands Williams can continue to work off the ball, which he did a fair amount last season. Williams shot 38.5 percent coming off of screens (42.9 percent when coming off of screens to his left). He tended to put the ball in a teammate’s hands, go to the block, and get open off of a pin-down screen. What makes this work is that the Nets had another player (in most cases MarShon Brooks) who could handle the basketball and deliver a pass on time. If Johnson can make the right pass on time, something he struggled with in Atlanta, the Brooklyn Nets may be onto something. Can Joe Johnson and Deron Williams coexist? I think so, and I’m even willing to say that the Nets can be a very efficient team with a Williams/Johnson/Lopez core. But Johnson must accept a new role. If each game becomes a dribbling contest between Williams and Johnson, the Nets will be in trouble.